Cover designed by Asaf Lewkowitz. Cover photos by Shirley Barenholz. - December 8th 2009 and March 24th 2010 broadcasted by the Dutch Jewish Channel on Dutch Public Television as “Op de Rand van de Droom”. - March 21st 2010 screened in movietheater De Uitkijk in Amsterdam, Holland. “Children of Hope” in the library 'VANnU' in Roosendaal, Holland. This documentary shows a personal portrait of three children from socio-economically deprived families in Israel. Despite their poor living conditions they strive for a better future using their determination and fantasy. “At the Dream’s Edge” is set against the backdrop of the growing gap between the rich and the poor and the question what is left of David Ben Gurion’s dream. Moshe’s father lost his job in 2002. Since then the family’s living conditions have dropped below the poverty line. Moshe himself is therefore working two jobs, during his final exams and until a few days before he is drafted into the army. This way he can provide for himself and also help his family by contributing some money. But Moshe is also an excellent student and he knows that education will be the only way out of this circle of poverty. 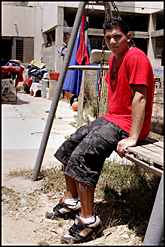 Kelly lives in a city tortured by stigmas, ethnical tension, crime and drugs. Her divorced, working mother puts all her efforts in giving her children a better future than Jaffo has offered her. Her biggest wish is to move to Tel Aviv, but it is not sure if that will ever be financially feasible. The “Jaffa Institute” in Jaffo, where Kelly daily goes to after school, is like a safe-haven and keeps the children from the streets. There Kelly receives a warm meal and participates in all kinds of (educational) activities. 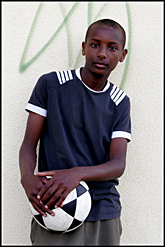 Moshe was born in Israel just a few months after his family arrived there from Ethiopia in 1994. The integration of the Ethiopian immigrants is still problematic, mainly due to huge cultural and sociological differences. Lots of youth get off track, as they lack good guidance and care. That is why the youthcenter with its special activities for the Ethiopian youth is so important. Moshe is well aware of the dangers of the street and enjoys going to the youthcenter. He dreams of a successful future as a dancer or a soccer player.